Featuring over 37,000 square feet of event space along the scenic Museum Reach, El Tropicano Riverwalk Hotel in the ideal destination for weddings, meetings, and special occasions. 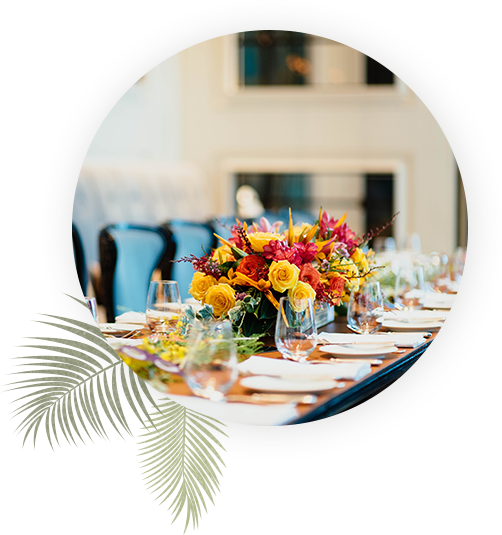 Flexible venue spaces, tropical settings, and warm ambiance set the stage for our custom catering and event services to shine. Our state-of-the-art meeting facilities offer everything you need to run the perfect event, including audiovisual services and Internet access as well as a range of dining options to accommodate coffee breaks and catered lunch buffets. El Tropicano is a romantic year-round destination for local and out-of-town brides. Our Versatile ballroom layouts and customized design options can accommodate everything from an intimate wedding ceremony to a grand reception to follow. As your party guests arrive, allow them to soak in scenic views of the historic San Antonio Riverwalk and bask in our tropical Latin-inspired atmosphere, perfect to spice up the spirit of your child’s Quinceanera. At El Tropicano Riverwalk Hotel, every dish and every drink is served perfectly. From coffee breaks and cocktail receptions to birthday parties and banquet dinners, our Executive Chef and professional catering team will ensure a memorable event.